So it’s been like, 3 days! Where have I been? Sorry for the lack of posts for a few days, work got busy and dared to get in my way. So here’s the state of the Load/Error nation: I’m STILL battling my way through Zelda: Link’s Awakening and loving every minute of it. The game is loaded with character and the enemies are varied and enough of a challenge to stop things from getting boring. I’ve battled my way through the woods, grabbed a magical book, and am now on my way through the Desert Palace in search of booty and a rare amulet! Along the way I got sidetracked by a minigame where I could get a piece of heart if I was fast enough. It took many attempts, but I would not be deterred! I also encountered a new lethal enemy, the Beamos. They look like Daleks but THESE things can shoot properly. Oh NO! As far as modern gaming goes, my Xbox One continues to lie dormant. Sleeping and preparing for the inevitable onslaught whenever I get the urge to rejoin the 21st Century. I HAVE been messing around with my VR Headset – but I think I’ll leave that commentary for a feature post. There’s one certain experience I can’t WAIT to tall you guys about! In exciting news, E3 is just around the corner (for those who don’t know, that’s the Electronics Entertainment Expo) and it’s where companies like Sony, Microsoft, Bethesda and Ubisoft premiere their big upcoming releases, as well as a few surprises to shock the audience. 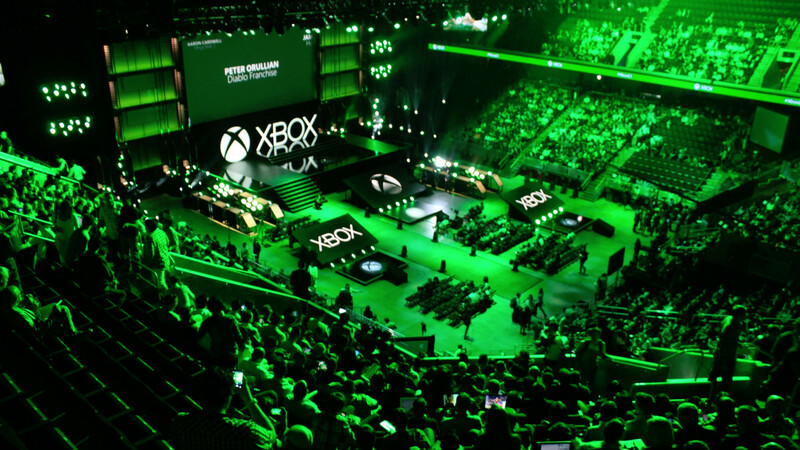 Microsoft E3 last Year… Yikes! I am hoping to watch EA, Microsoft, Ubisoft, Sony and Nintendo’s shows this year (not bad considering the crazy shifts I have at work) during each show I’ll be smashing out a “reactions” post here on Load/Error. Can’t WAIT to see what the Industry’s giants have in store for us! Mike, my good friend you may have read about in the Blackpool post, has challenged me to a speedrun on one of my favourite games, Resident Evil 2. Challenge accepted, Sir! Some training first and then I’ll do the whole thing live. DO IT LIVE! Hi William! Been a while, bud! I just want to thank all the users who have logged on and taken the time to look at the Blog, now I’ve got it out in the open. I can view page stats for each day and that little hit counter on the right hand side of the home screen brings me great joy! Keep spreading the word. We all know a geek like me! Finally, I want to single out a good friend, brother-in-law and fellow blogger Ben, who runs “Views From the Sofa” (link on the right, go check it out, if you’ve ever seen a film you’ll love it!) Ben has gone out of his way to welcome me to the blog world and the likes and comments are much appreciated! That’s all for now folks, a little short I know, but I’ll be back with a bang on Sunday. Posted on June 10, 2016 June 14, 2016 by itsonlyleggyPosted in MiscellaneousTagged Update. Previous Previous post: Opening doors officially!